Xin Inventory 2.0 comes with range of quotation templates, invoice templates, purchase order template (PO template), delivery note template / packing slip template, receipt template, credit note templates and customer statement templates with or without signature and company logo. User can choose the suitable template for their business used. User can upload business information like business logo, business name, business address, business phone, fax and email into the system and it will be displayed professionally in templates. 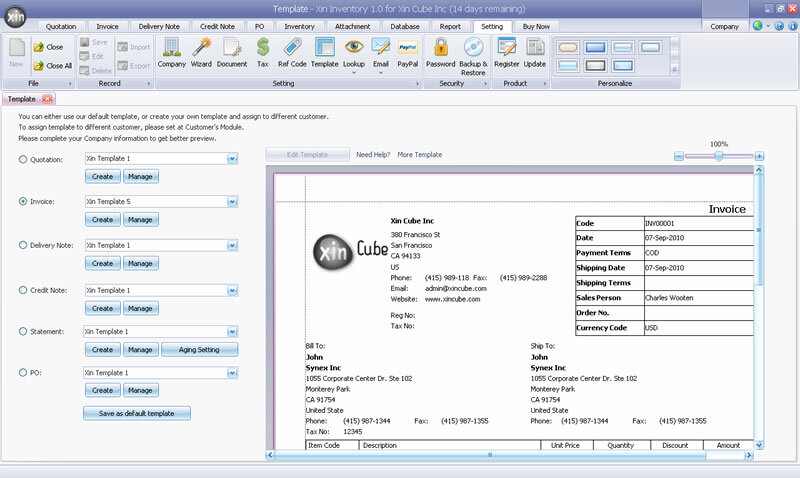 Xin Inventory 2.0 comes with template editor which provide flexibility for the user to edit the invoice template according to their business needs. We do provide template customization service. Please contact our support team to know more. ”I searched for a long time to find software that would keep track of inventory along with customers and invoicing. I had Quick Books for many years and was terribly dissapointed in it. Xin was the only soft ware that had all the features I needed! I downloaded it easily, added my inventory and customer info and …bam..ready to go! 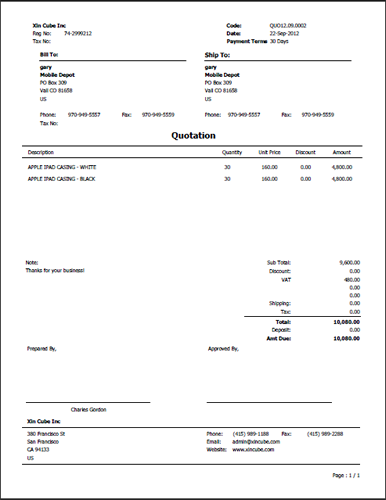 ”I was looking for a software to generate quick and nice invoices for my company. i tried so many but it was just a wasted time doing that. at the end of the night i came across with Xin… well i downloaded it “trial version” and just with the first window showed up. i knew that this is exactly what i need. just Simple and EASY!! believe just easy. customers, quoatations, invoices, so easy to use and set in minutes. Nice templates. Just awesome. I´m from colombia and i sent a mail to xin support asking for spanish version after that they contacted me back saying if i could translate it to spanish! and i did! now i have my Xin invoice in spanish just awesome!